Having arrived into Bursa and having taken myself off the main roads my adrenaline levels dropped and I tried to find a cheap hotel. Initially this proved difficult as the only one I could find did not really have anywhere I could put my bike. Luckily after some aimless rolling I eventually found a hotel district and asked the first hotel I got to ‘how much?’ Sadly their answer was too much and I readied myself for a period of pushing my bike between hotels until someone came up with a number I liked. Then out of nowhere someone was speaking English and next thing I knew I was being led to a cheap hotel with room for bikes by an Austrian cycle tourist called Orsi. 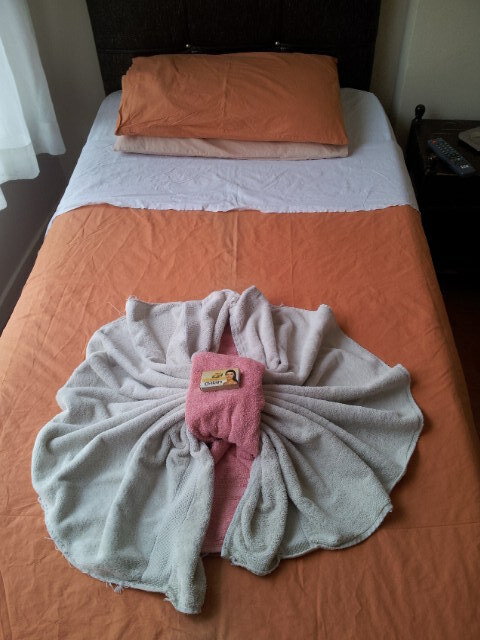 Orsi had already negotiated a good deal for her room so I piggybacked on that and got the same deal as she did, which included breakfast. It was good to meet another cyclist after quite a while and we exchanged stories and advice. Orsi made me feel overequipped as she had gotten all the way to Ankara on a very old city bike wıth a rear rack stuck on the back wıth no trouble. Sadly we were heading in opposite directions and when I struck out from Bursa in the direction of Ankara it was alone again. What was worse was that over the course of my rest day in the city the weather had changed…dramatically. When I rode into Bursa I had been worried about getting too hot riding. When I rode out it was tipping it down with rain and had gotten a bit chilly too. The rain barely relented the whole day and I spent most of my time wiping the water off my mapcase so I could read my kindle. One plus of the day was trying an Inegol kofte in Inegol itself. I’d had no idea what an Inegol kofte was at the beginning of the day but the number of restaurants with signs advertising it clearly showed that it was a ‘thing’ so I decided to pull into a restaurant and try it. It is basically meat balls, I love meat so I was happy if not overwhelmed. The meat balls are so famous there is even a statue to them in the town, I could not take a photo as it was raining so hard but the internet had one already. Meatball photo After Inegol it was more dreary riding through rain until I reached Bozuyuk. This was a bit of a nothing town with one long main street not made any more picturesque by the dark and rain. On the plus side it did have a cheap hotel, so cheap that the showerhead came off in my hand. The next day the rain stopped but it got colder. I was now wearing arm warmers and leg warmers. 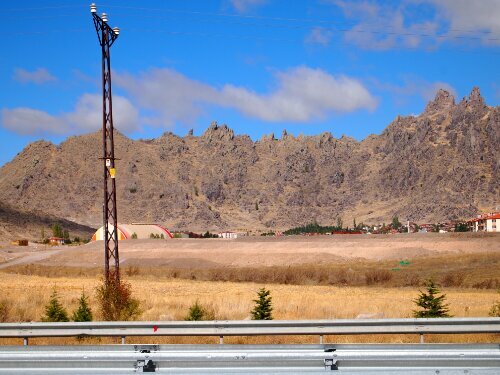 Thankfully it was a short ride of only about 50km to my next stop: Eskisehir. I shivered my way into town as quickly as possible. 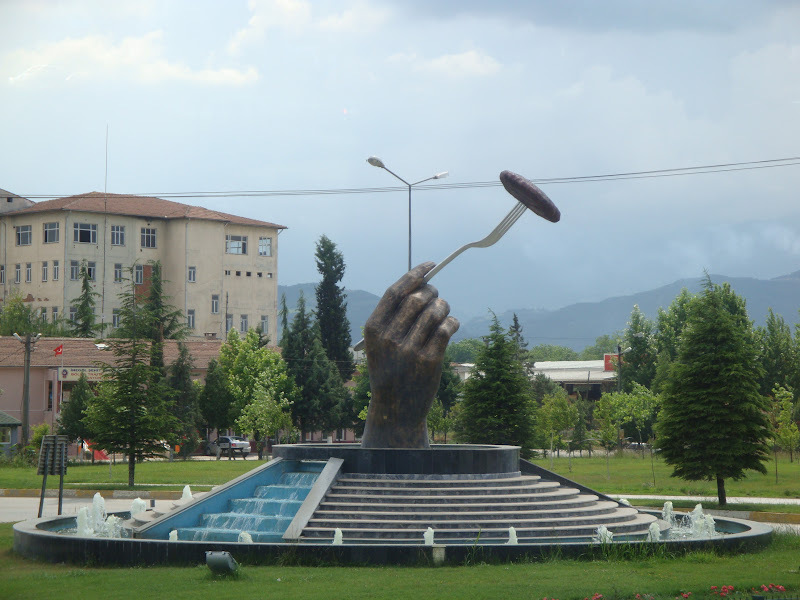 Eskisehir was a much bigger place than I expected – a full blown city in fact – so as I cycled in I hoped I would be able to find a hotel easily. I need not have worried as a motorcyclist called Salcuk (sp?) who spoke English was kind enough to lead me to the hotel area and I found a particularly cheap one. At least they tried: With half a day to kill in the city I had a wander around. 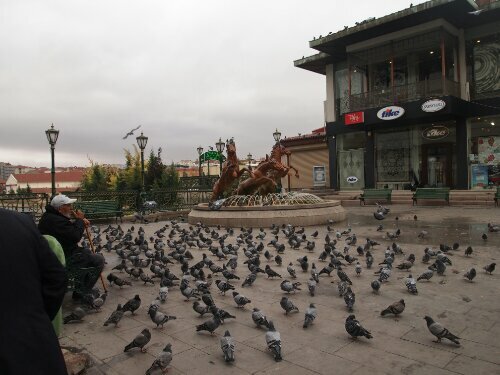 Eskisehir had clearly taken a lot of influence from Europe with riverside walks, public parks and wide streets. Sadly it was still freezing off the bike so I did not see as much as I would have liked before ducking into a warm cafe. 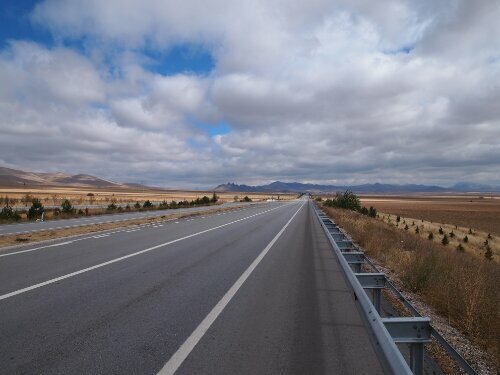 The next day I set off for what I thought would be the first of a couple of hard days riding to Ankara. I had pictured hilly unpleasant roads and slow going. Thankfully there was an incredible tailwind and I flew along to where I had expected to stay the night: Sivrihisar. This was an interesting looking town surrounded by mountains but not interesting enough to make me stop when it was only just lunchtime. I rode on, hoping I would make it to another suitable place to stop. It was still very cold and I was now wearing arm warmers, leg warmers, two buffs, a hat, thick gloves, long sleeved cycle jersey and a rain jacket. Stopping for any length of time meant losing feeling in my fingers so that was pushing me on as well. Then I saw another cyclist ahead – not a man on a bicycle – which you see a few of but a real cyclist. In other words someone dressed as stupidly as me and wıth a bike younger than him. This rider it transpired was Emre, a 24 year old Turkish army officer cycling home from his base. We chatted as we rode and Emre was kind enough to invite me to stay at his place in Polatli, which was the furthest point I had hoped to reach that day. Emre was incredibly generous, getting me dinner and breakfast and telling me lots of interesting things about the army and his real passion: electronics. The next day he insisted on making the 75km ride to Ankara with me which made the journey a lot more pleasant and the ride into the city a lot less scary. Though having been driven in Albania and after the initial shock of Bursa I am a lot less nervous in traffic. Go Riches go you are amazing!!!! !